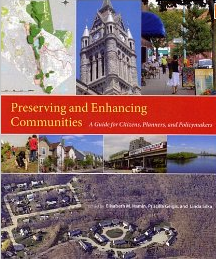 Preserving and Enhancing Communities: A Guide for Citizens, Planners, and Government Officials. This edited volume provides a complete, thorough, and accessible introduction to community planning for members of planning and other regulatory boards, for students, and for planners and policymakers. 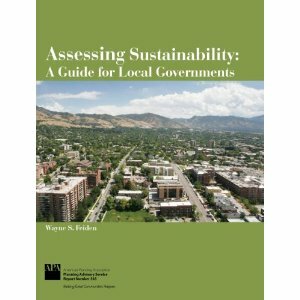 Each chapter provides an introduction to the social and ecological principles of the built environment, and explains ways to realize smart growth in local settings. The book's focus is how to achieve better communities through the every day functioning of local governments and the volunteers who staff the local boards. Chapter 4: Thinking Like a Developer: Partners, Adversaries or Competitors?, by Robert H. Kuehn, Jr.
Chapter 10. Natural Land: Preserving and Funding Open Space, by Robert L. Ryan and Arthur P. Bergeron, Esq. Controversy inevitably accompanies attempts at land protection, even in cases of large, uninhabited, economically marginal locations. In 1994, for example, the California Desert Protection Act created the Mojave National Preserve, the third largest national park in the lower forty-eight states. The act transferred three million acres of southern California desert from the Bureau of Land Management to the National Park Service. As a result, explains Elisabeth M. Hamin, the National Park Service became a multiple-use manager, balancing its official mission of environmental protection with oversight of such activities as hunting, ranching, and mining. 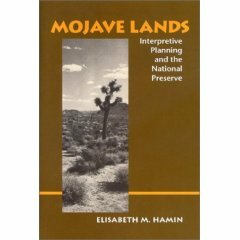 In Mojave Lands: Interpretive Planning and the National Preserve , Hamin explains how this new role came about. Drawing on interviews with people on various sides of the issue -- from mining lobbyists to local ecotourism operators, legislators to gun advocates -- she shows how the differing parties argued and compromised over land protection. From their success, Hamin derives lessons for reimagining national parks to achieve broadly shared goals. Introducing the concept of "interpretive planning" -- a method that takes into account conflicting views of all interested parties -- she offers explicit steps for the planner and policy analyst to use. This book will appeal to scholars and students in environmental studies, planning and landscape architecture and history, as well as professionals in planning, resource management, the National Park Service, and related conservation organizations, public and private. Book Review by Gerald Hillier, Journal of Planning Education and Research, Mar 2005; vol 24: pages 342 - 343. Book Review by Laura R. Musacchio, Landscape Journal 24:1–05, pages 100-101. Book Review by Timothy P. Duane, Journal of the American Planning Association , Summer 2005, Vol. 71 Issue 3, p346-346.